In 2012, the leaders of Bangor Theological Seminary faced some tough choices. Like many seminaries across the country, they were seeing declining enrollment and were struggling to adapt to changes in the church. The board made a dramatic decision: it would shut down the seminary in its traditional form and use the remaining endowment to create The BTS Center. The center would retain an educational mission and remain related to the United Church of Christ. But it would pursue that mission in new ways. Questions still remain about exactly what form the center will take and how it will define success. But after several years of planning and study, the center is ramping up its offerings, with grant awards for innovation, online course offerings, lectures, workshops and an annual convocation. The Rev. Dr. Robert Grove-Markwood is the executive director of The BTS Center. He earned an M.Div. and a D.Min. 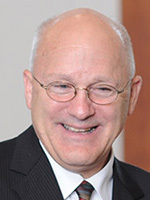 from Bangor Theological Seminary, was the school’s admissions director in the mid-1980s, and served as a trustee, interim president and then president of that institution. In this interview with Faith & Leadership, Grove-Markwood talks about what’s happening as the institution re-creates itself. The following is an edited transcript. Q: Where are you in your process of creating a new institution? What do you see as the pluses, minuses, successes, failures of your new model? I feel very good about our process. I wake up some days thinking, “Oh, this is taking too long. We need to be much more urgent about timelines, and we’ve got to get more stuff out there.” But then there’s a more complex part of the story for us. Part of the story is an endowment, at least a modest one. So we have some capitalization that helps us not panic, I would say. We have three full-time staff, with several contracted employees for financial, web, design and program support. Right now, we have an eight-member board that we will expand by another two or three in the next year. I’d say we’re still building out our infrastructure. For me, the exodus narrative is the operative metaphor or image these days. We’ve just launched an incubator, a project-funding incubator, which began July 1 with five projects that we feel very nicely align with our mission emphases. We are still in the exploration stages about whether there is some specific program or curriculum piece that fits into our larger puzzle. But for the most part, we feel like in two years we’ve moved the ball down the field. We’re moving forward and feel very good about our progress. Q: What are the similarities between The BTS Center and your previous format? I think we still are very much in the same business, interpreted for today’s needs. A colleague told me once, it’s almost as though we’ve gone back full circle. In some ways, what we’re trying to do now more resembles what our founders were trying to do with the Maine Charity School in 1814. They had in mind building a different kind of school for preparing ministers for their own time and context. Our theological perspectives, our worldviews are radically different, and our needs have some nuanced differences. Yet there’s something unique about faith leadership in a rural and small-church, small-town context that we still want to pay attention to. We want to stay as close as possible to those areas, which in some ways are being abandoned or left behind. We no longer offer degrees. I think there are real similarities between what we used to do and what we want to do in the future, especially regarding audience, but there are also some radical differences in pedagogies and structures and having a sustainable business model. Q: You are still in the process of re-creating yourself. What are some of the open questions that remain? I think where we are now is trying to respond faithfully and innovatively to the global shifts in religious and spiritual belief and practice. These shifts are changing our understanding of audience and requiring us to think differently about how we equip and support faith leaders. How do we move from degree-granting to offering non-degree theological education and formation in ways that have integrity and rigor, are academically informed and are affordable for our audiences? How do we effectively engage an audience that probably isn’t going to be face-to-face most of the time, if at all? We’re not the only ones asking these questions about the necessary evolution of theological education. We don’t have to completely reinvent the wheel. But there is room for creativity and innovation. The Convergence network started a conversation about reimagining theological education that we have joined. We agree with others who see this as a critical issue. I would say if I had to limit my description of what we’re doing to just two words, it would be “leadership development.” But then that begs the question, what do we mean by leadership? For whom? For what? It’s not leadership to maintain or preserve some past and privileged status quo. It is leadership that resists traditional labels and forms. We have work to do to redefine and articulate new understandings of roles and relationships for titles and roles that we have come to take for granted, like “clergy” and “laity,” for starters. Q: What activities do you do as an institution now? We continue to have an annual convocation-- in January, in Maine! Two years ago, Elizabeth Drescher and Keith Anderson joined us to talk about digitally integrated ministry. Last January, Troy Bronsink -- a Presbyterian minister -- talked about design thinking with the theme “Life as Art.” This year’s theme is “Course Corrections.” Our scholar-in-residence, Dr. Pam Shellberg, will lead an exploration of Paul’s story as an analog for how we can navigate disruptive change and reorient ourselves. In the spring of 2017, Pam is going to expand and extend the “Course Corrections” convocation material through a webinar course offering. So “course corrections” has become a metaphor for our mission, big picture. We have a weekly blog, Bearings: Navigating Life-as-Ministry, that our associate director, Alyssa Lodewick, edits with Elizabeth Drescher. We consider our bloggers a go-to source of insight about the changing contours of church and religious and spiritual landscapes. We’ve been consulting with Elizabeth for three years, and this fall she is teaching an online course, “Spiritual Stories for a Wired World,” which is helping folks develop a more public voice through blogs and other channels. It’s a focused writing workshop. I’ve already mentioned our Innovation Incubator, which we think has great potential. We have several other scheduled one-off presentations, and I would point folks to our website. And a big part of my work is to be in conversation with individuals and organizations to explore possible collaborations and partnerships. Q: How did this change come about? There’s a larger arc and history, but I’ll answer from a more up-close and personal perspective. I’m a double graduate of BTS. In 2006, I became a trustee, and in 2011, I was asked to be the interim president to continue important work on several urgent, strategic initiatives for growth. During that interim time, we were working on the business plan and how we were going to recover from the 2008 financial meltdown and an arc of declining student enrollment. We were not the only ones with these concerns. We were working with Auburn Seminary consultants Barbara Wheeler and Tony Ruger to help us think through a new business plan. And in working with them, well, we had that come-to-Jesus moment. It was Tony who voiced an assessment of our plans, in the sense of, “It looks good on paper, but …” So we revisited our process and tried to look deeper, as openly and objectively as we could, at the data from ATS, at Auburn’s research about what was going on out there, and at many charts where most of the numbers were negative, dwelling well below the line -- which is where we were. We estimated we might be able to keep our current program going two to five years more. Realistically, I think we would have lasted two or three years before drawing the endowment down to permanently restricted principal that we could not have used for operations. And we would have been stuck. We chose to act in time to preserve enough endowment to do something different. The answer was unquestionably, unanimously, “No, we cannot.” Then the follow-up question was, “What’s next?” We chose to not rush to what’s next. We chose to take time to grieve, to finish the work that was in process and do our best to end well, helping as many current students as possible complete their degrees. So we negotiated a generous teach-out with Andover Newton. They took on most of our students that weren’t able to finish in that final year. We developed severance agreements with faculty and staff. And we began a yearlong process of physical transition from a small graduate school to an even smaller nonprofit. Q: What was it like for you personally, given your long history with the institution? I had been a trustee for five years and was not naive about the challenges we were facing. Being interim president felt like a 24/7 experience for me, so I had a lot of time to work through the issues, and it was hard. I was saddened by the decision but absolutely confident in the decision process and the new course being set. The hardest part for me was the consequences of the decision: the grief, hardship and loss for our faculty, for students, for staff, for a lot of alums. Some are still working through the grief and disappointment. For me, because of my involvement throughout the whole transition, I could affirm that BTS is still here, though in a different form. It was also made easier by those folks -- alums and non-alums -- who could recognize and articulate that there was wisdom in choosing this path. They were saddened by a clear sense of loss, too. But many have supported our choice to sustain a future mission that we trust will benefit the wider church, and future communities of faith, even if we haven’t figured out all the details. It was a sober time, but I have never second-guessed the board’s decision. As painful as it was, this was the right thing for us to do. Q: You mentioned your endowment -- you preserved it for something new rather than spending it down. What did you end up with? We went through a lengthy legal process, petitioning the courts to modify the restrictions on parts of our endowment, and received approval right before the final graduation in June 2013. The historic endowment is available for The BTS Center to use to fulfill its re-conceived mission. We’re committed to prudent draws on income, not spending principal, funding operations completely with investment income. We don’t want to be captive to the whims of the market. Thanks to a robust recovery for the markets after the fall of 2008, we have sufficient invested funds to support doing something new that we feel will make a difference. It is a modest portfolio, but it is a blessing for a small organization. So we have this legacy of the past that will allow us to have a future. Q: But now, as a smaller organization, you’re sustainable? I think that’s fair to say. For now, this is our starting place. Fundraising is of concern to the board. We do have event registrations and course fees like other organizations, and we have collaborated with other organizations to co-sponsor events and activities to leverage capacity. And there remains a cohort of supporters who still make annual giving a priority. But at this point, most of our revenue is investment income. We’re trying to build -- or rebuild -- a tribe, and we’ll do what we can do to scale from there. But does that mean “scale” by growing in size or in impact? I think we can remain small and have great impact. For now, T.S. Eliot’s line of poetry functions as an unofficial tagline -- “We shall not cease from exploration.” It’s a new frontier we are exploring, but a frontier is where we started.